Take your photograph, making sure that the subject is completely in front of your solid background. Good lighting helps — I had a sunny day. Here you see the original photo; you can see the edges of the table at the top. Upload your photo to your computer. If you’re still using film, you’ll have to develop it, and then scan it. 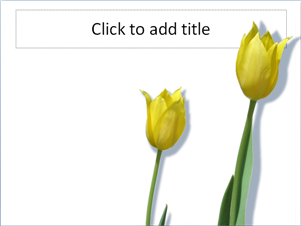 In PowerPoint, click the Insert Picture button on the Drawing toolbar or choose Insert> Picture> From File. (In PowerPoint 2007, choose Insert tab> Illustrations group> Picture.) Double-click your picture file. Adjust the placement of the photo as desired. You may also want to resize it by dragging on the corner handles. 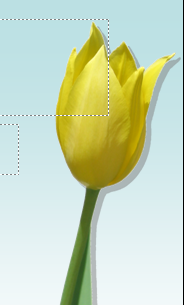 With the photo selected, choose Set Transparent Color from the Picture toolbar. (If the Picture toolbar isn’t visible, right-click any toolbar and choose Picture from the list of toolbars.) (In PowerPoint 2007, choose Format tab> Adjust group> Recolor drop-down list> Set Transparent Color.) You’ll see a special cursor. Click anywhere on your solid background. The background becomes transparent. Here you see the result. You can now see the placeholder through the image. Notice that the area at the top that wasn’t off-white is still there. Crop any areas that you don’t want. 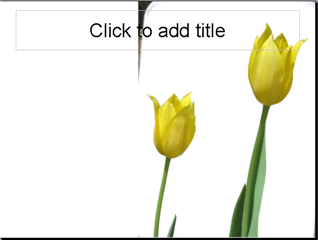 To crop, click the Crop button on the Picture toolbar. 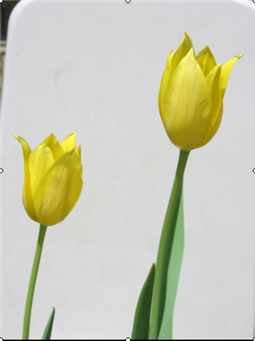 (In PowerPoint 2007, choose Format tab> Size group> Crop.) Then drag inward on the cropping handles as necessary. The result is beautiful as is, and would be worth a tutorial by itself, but there’s more! You’re now ready to add a shadow. Select the image, and choose Shadow Style from the Drawing toolbar. Then choose one of the Shadow styles. 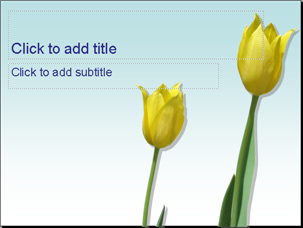 (In PowerPoint 2007, choose Format tab, Picture Styles group, Picture Effects drop-down list> Shadow. and choose one of the styles.) 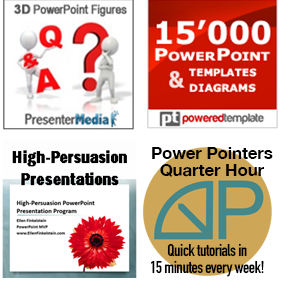 PowerPoint draws the shadow around the object, ignoring transparent areas! Look at the first two images above for the results. With no transparent areas, the shadow would display around the rectangular shape of the entire image. You can adjust the shadow to make it more dramatic. Click Shadow Style from the Drawing toolbar again and choose Shadow Settings. On the Shadow Settings toolbar, click the middle four buttons to move the shadow. The farther away the shadow is from the object, the more visible it is, and the more dramatic it becomes. You can also click the Shadow Color drop-down list and change the color of the shadow. 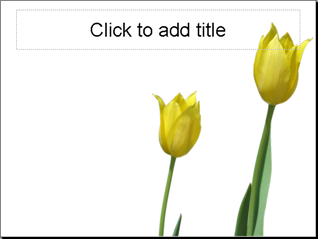 (In PowerPoint 2007, choose Format tab, Picture Styles group, Picture Effects drop-down list> Shadow> Shadow Options, or click the dialog box launcher in the Picture Styles group to open the Format Picture dialog box, and then choose the Shadow category. There you can change the color, transparency, size, blur, angle, and distance of the shadow, for truly amazing flexibililty!) I used PowerPoint 2007’s options for the shadow below, increasing the size, distance, blur, and angle, and giving it a blue color. 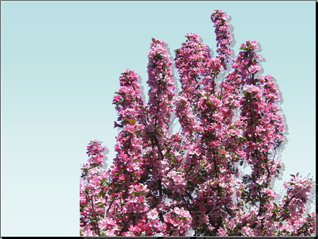 Here’s another example, with the crapapple tree in my yard. It was taken against a blue sky, but the background on the slide is a blue gradient. Do you see the shadow around the details of the tree? Unfortunately, the sky wasn’t all the same color blue, at least not enough for PowerPoint, so I used Photoshop Elements’ Magic Wand tool, which selects areas of similar color. It’s more flexible, because you can specify a tolerance (color range), whether or not you want continuous areas only (I didn’t), and more.